Breaking ‘da bank’ of a casino and winning all of the cash from their highly secured vault is a dream of all online casino players, but will the Break da Bank slot machine from Microgaming provide you with the opportunity to send a casino bust? Unfortunately, not! In the early days of Microgaming this was actually one of their most played online slots, however over the years we have seen incredible advances with the explosion of slots in 3D and second screen bonus games becoming the norm, resulting in the dwindling popularity of fruit machines as a result. Break da Bank is a 3 reeled slot with 5 paylines reels which are situated on top left of the screen above the bold Break da Bank logo with payout information listed on the left. There isn’t even a pay table button as it is so simplistic, and what makes it even more dull is the lack of background music – heck even the sounds of a busy pub would have added some atmosphere! If you’ve played online slots before you’ll already know that it’s best to play with all paylines activated in order to have a greater chance of winning, however playing for all paylines in Break Da Bank may literally break your bank! The coin values range from 20p up to £10 and with five coins allowed to be bet per payline and five different betting levels this means there is a variety of options available to you depending on how deep your pockets are. Should you opt to play for the minimum number of coins and only one payline this will cost you £1 – but your chances of winning regularly will be very slim. In contrast you can play with all paylines activated and maximum coin values for £250 per spin – which is certainly not for faint hearted and ultimately means Break da Bank is one to avoid for low stakes players. The symbols used by Microgaming in the Break da Bank slot machine are quite possibly the worst that I’ve ever come across – incredibly boring and showing a true lack of imagination from one of the biggest slots developers which is a great shame. 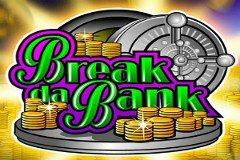 You’ll encounter a total of five symbols in Break da Bank with the Wild being a vault full of golden coins and the Break da Bank logo on top, and as how online slots work in most cases, it substitutes for all other symbols. There is also a $ sign, with the other being the simplistic ‘bar’ symbols so commonly used in traditional slots with a single bar, double bar, and triple bar all featuring. It’s the Wild that holds the most value in Break da Bank and should one of them contribute to a winning payline you’ll enjoy a 2x multiplier, while if two Wilds contribute you’ll enjoy a hefty 4x multiplier instead – a feature that always helps to boost your bankroll. The biggest payout of all is worth 2,400 coins and this is achieved when you are playing all five paylines and manage to cover the reels in Wild symbols. In comparison you’ll win should you land any bars in a combination but only 5 coins, while three single bars on a line pays 10, three double bars on a line pays 40, three triple bars on a line pays 80, and three $ symbols sees you rewarded with 160 coins – so the emphasis is clearly on landing those Wilds! While this is one of the oldest slot machines from Microgaming, it is sadly one of the worst in such modern times when we have become accustomed to slots with 3D graphics and second screen bonus games. Thankfully Microgaming took players feedback on board and have since released a sequel titled Break da Bank again plus Mega Spin Break da Bank, which is essentially four 5-reeled versions on screen at once, similar to how the Lucky 5 Reeler slot machine from Barcrest works. Alternatively, if you prefer classic slots that do have features I’d suggest checking out NetEnt’s Stickers slot machine instead – it’s a slick modern day take on classic slots that offers sticky Wilds and very high payouts.